Dentyne classic cinnamon gum. Dentyne is a great gum to freshen your breath with a refreshing cinnamon flavor you can actually taste the tingle. You get 12 packs each with 18 pieces of gum. 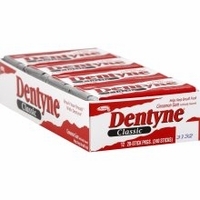 There are many flavors of Dentyne gum available, but there is something about the classic gum. While many others cinnamon flavored gums and strong and bold, this gum has just enough flavor for you to taste without it being overbearing and hot.